Growing Up and I’m Fine. 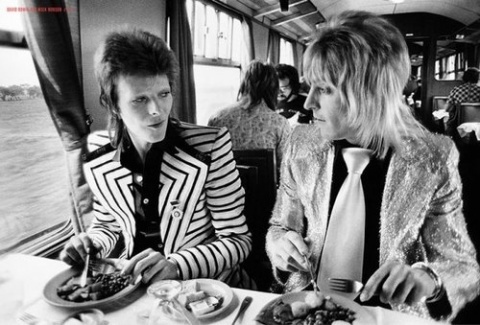 The creative partnership of David Bowie and Mick Ronson, which in four years had produced The Man Who Sold The World, Hunky Dory, Transformer, Ziggy Stardust and Aladdin Sane (Pin Ups is a footnote), withered and died in the last months of 1973. Also, Bowie’s manager Tony Defries started grooming Ronson as a solo act, in part as insurance against Bowie becoming a commercial has-been (Marc Bolan’s singles were barely cracking the top 40 by late ’73). If glam had reached its sell-by date, Defries’ MainMan would have a rock guitar god ready for the shops. “They told me I could be the next David Cassidy,” Ronson later said. MainMan would have Ronson’s face plastered on billboards in LA and Times Square. Finally, Bowie felt he needed to clean house, and acted swiftly and brutally. He had already dropped Woody Woodmansey and Trevor Bolder, was about to end his relationship with Ken Scott, and was considering leaving his wife; he moved out of his longtime home Haddon Hall and, in March 1974, left England for good. So Ronson, despite his past and his potential (you can imagine Ronson on Station to Station or Low), was consigned to Bowie’s discarded life. 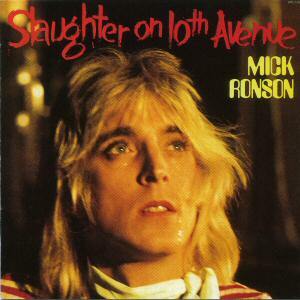 Ronson began recording his solo record, Slaughter on 10th Avenue, in August 1973. It’s unclear whether Defries prodded Bowie to provide some new material for it, or whether Bowie volunteered some songs (Bowie did suggest that Ronson cover Richard Rodgers, which became the title track). Relations between the two hadn’t deteriorated yet. That said, where Bowie, in a more fruitful era, was content to give away “Oh! You Pretty Things” and “All the Young Dudes,” his Ronson contributions were a cut below his regular work. “Hey Ma, Get Papa” is mainly Bowie’s words fitted to Ronson’s music, with Ronson seemingly inventing Queen in the process. The best of the lot was Bowie’s only sole composition on the record, “Growing Up and I’m Fine,” which in retrospect seems like Bowie’s farewell note and blessing to a man who was once, to quote Charlie Parker on Dizzy Gillespie, his worthy constituent. This entry was posted on Monday, August 16th, 2010 at 9:40 am and is filed under Middle RCA Years: 1973-1976. You can follow any responses to this entry through the RSS 2.0 feed. Both comments and pings are currently closed. Great pic – they’re en route to Aberdeen, apparently. Just thought I’d tell you that. The Bowie – Ronson thing is a little like Macca and the Beatles. On Maybe I’m Amazed you hear Paul doing Ringo drumming and Harrison guitar and you think did Paul write the instrumental parts all along and tell the other what to do or was he copying their style and feeding it back to them. Similarly with Bowie on Diamond Dogs you hear him do a (pale) imitation of Ronson guitar. The truth is probably that they grew musically together. Alternatively, Ronson’s vocals on Slaughter hew so close to Bowie’s that one suspects a guest vocal from the latter at times (though closers listen reveal a certain lack of technique/self-assurance). A truly symbiotic relationship. Shame that the two Ronson albums and the songs Bowie gave to him are barely discussed here. Although not A+ work they are definitely B+ and well worth seeking out. In fact, if you ever wanted a definition of glam just listen to Ronno’s Billy Porter. Credit where it’s due: Growing Up and I’m Fine is catchy as a clam. Remember hearing a story that Billy Porter was somehow connected to Lou Reed? Either based on walking around New York with Lou or the stories he told Mick. That’s awesome, Ronson is a true genius, it’s a shame both Ronno and Bowie died with liver cancer. Sometimes I wonder how nice would’ve been if Queen have worked with Mick, but the closest we can have is Freddie’s Tribute Concert performance. It’s based on a conversation between Lou Reed and Ronson, about muggings, mixed in with some lyrics about a mutual acquaintance (the eponymous Billy Porter). a curious memory resurfaces from my 1st year in NYC, meeting a pretty successful sculptor whom a friend had apprenticed with, and his describing playing basketball with Ronson, and delivering the musician a fist to the face for some reason [maybe merely for his ‘prettiness’]. Did Bowie ever cut a demo of Growing Up and I’m Fine? there’s one on youtube attributed to him. Think it’s a great version but likely a fake.